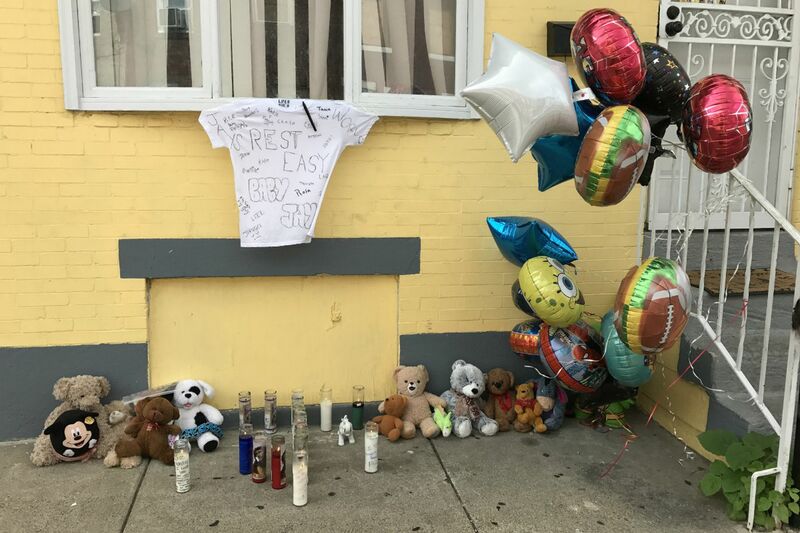 A memorial of candles, stuffed animals, and balloons were seen Friday, Aug. 3, 2018, outside a Port Richmond rowhouse, where a toddler was fatally mauled by pit bulls on Wednesday, Aug. 1, 2018. The city Medical Examiner's Office has identified the toddler who was fatally mauled by pit bulls in a Port Richmond rowhouse Wednesday as Javon Torres. Office spokesperson James Garrow said an autopsy Friday morning determined that the death was "accidental" and resulted from "multiple blunt and penetrating injuries." Police have said the boy was 2, but a man who said he was a family member told reporters Thursday that the victim was 3. Officials said they did not know the boy's date of birth. Family members could not be reached Friday. Outside the rowhouse Friday, a memorial of lit candles, stuffed animals, and balloons decorated the sidewalk. Neighbors also had signed and hung a white T-shirt in Javon's memory. It said: "Rest easy, Baby Jay." One neighbor said that three women, who appeared to be relatives of the child, went to the home late Thursday near midnight and placed three candles outside. The women were crying, said the neighbor, who did not want her name published. Written with a marker on one of the candles were the words: "I love you soo soo much baby. Mommy so sorry. I love you. My Jae Jae I miss you soo much." On another candle were the words: "Jae baby I love you. You was so funny and protective over your mommy. I'm so sorry this happened to you. But your [sic] in heaven now sleeping peacefully. Fly high Fly guy. Love, Titi Ashley." Police Commissioner Richard Ross said Thursday that the boy appeared to have been attacked by three pit bulls in the living room of the rowhouse on the 3000 block of Agate Street. Two other pit bulls were caged. Neighbors have said they didn't know who lived in the home. They recalled witnessing a frightening scene about 5:15 p.m. Wednesday when a woman emerged from the house screaming for help, as another woman was being attacked by the dogs in the living room while trying to protect the child. A police source Friday identified the woman who was trying to protect the child as Rebecca Olan, 27. He said she lived in the home and was the owner of the pit bulls. She was the boy's godmother but not a relative, the source said, adding that the boy and his mother lived elsewhere in the city. Upstairs at the time of the attack were Olan's 16-year-old cousin and a 25-year-old woman, whose relationship to Olan was not immediately known, the police source said. They apparently did not live there. Police have questioned the two and Rebecca Olan. Ben Waxman, a spokesperson for the District Attorney's Office, said Friday that no decision would be made on charges until the investigation is completed. Efforts to reach Olan were not successful. No one answered the door Friday morning at the yellow-painted brick rowhouse where the attack occurred. Police officers who responded to the attack Wednesday fatally shot two of the attacking pit bulls. Ross said the department's Officer-Involved Shooting Investigation Unit was investigating. The Animal Care and Control Team of Philadelphia removed all five dogs. The boy was pronounced dead at St. Christopher's Hospital for Children on Wednesday. Olan was taken to Temple University Hospital for injuries she suffered and has since been released, the source said.